This is how most mornings look around here. Some time between 6:30am and 7am I’m joined by at least one or two kids (this morning all four jumped in bed). 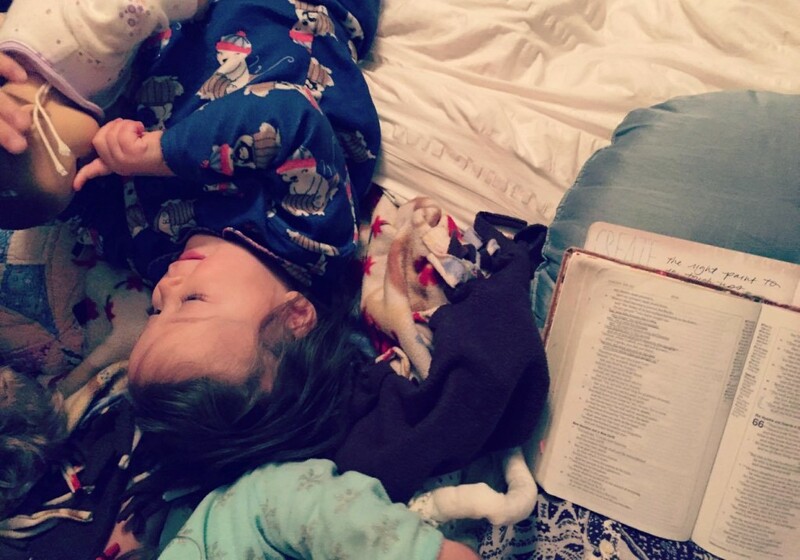 I read my Bible between snuggles, baby dolls, blankets, often Legos, breakfast requests (Can I have my Valentine candy? No. ), and voices that are not quite morning tones, but still I read and try to journal notes if someone hasn’t already stolen my pen. Let’s take a detour here. Quiet time? It’s a phrase widely used across AmericanChristendom, coined to describe a spiritual discipline of beginning the day reading the Scriptures and in prayer. It comes with the connotation that this is the ultimate ideal. Before you attend to anything else in your day, you should be in the Word and praying. This is what godly people do if they really love the Lord. You’re giving the Lord your first fruits, filling up for the day, you’ll fail if you don’t, etc. It’s no wonder so many mothers are discouraged, disheartened, and believe they’re failing at the Christian life. When you’re waking every few hours to nurse, rock a baby back to sleep, clean up accidents or vomit, awakened to a child standing over your bed asking for water/milk/food/a cuddle, it’s no wonder when the morning light starts to peek through they’re not ready for a morning coffee in their favorite arm chair next to a basket with their Bible, prayer journal, personal journal, and devotional or Bible study. They’re exhausted. Nevermind that the day before they probably spent 16 hours on their feet serving their family in some capacity or another. The thing they want and need the most–more Jesus–feels so far off in the constant demand of children and running a house. From my experience, it’s not a lack of desire that keeps women from the Word, but exhaustion and a framework of spiritual disciplines that are unhelpful. The idea of a quiet time is good in and of itself, but the emphasis we place on it, particularly that is must happen first thing in the morning and how often the weight of sanctification is placed on that thirty minutes to an hour of time can be harmful. Strive for time spent in the Word, pray often. Yes, Jesus often went off by himself in the morning to pray and commune with the Lord, but neither of these things must happen in your first hour or two. They should permeate all of our day in different ways. Detour ended. You may continue. Two things have helped me to just do it anyway, even if the circumstances aren’t my ideal. 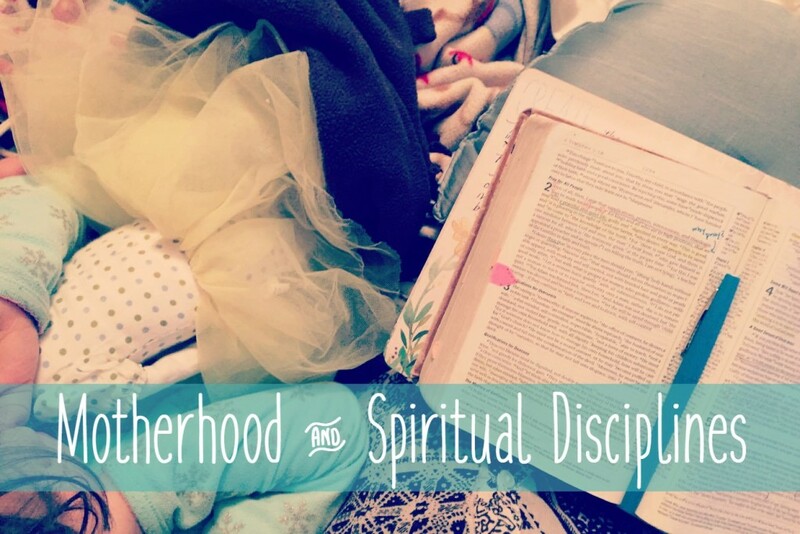 First, a pastor’s wife I knew once told me a story about a young mom who prior to having children had long, in-depth, meditative quiet times between 1-2 hours a day and after having kids she tried to keep this discipline. She ended up putting her children in high chairs at the table, giving them snacks and toys, while she tried to have her old quiet time. They would cry and try to get out, clamoring and just being little kids. It left her exasperated. She couldn’t meet the Lord in the Word the same way as she had before, though she tried hard to force it. I remember the pastor’s wife saying your quiet time is going to change when you have kids. It’s going to look different and that’s okay. Too often we put too much stock in what we think, or have been led to believe, a “quiet time” is suppose to look like and rather than just read the Word we get caught up in all the steps we think we’re suppose to do. Just open up your Bible and read. My kids are early risers? So what. I’m not pulling out the Greek as much as I use to? That’s fine. Sometimes I have to reread a passage, because the noise is too loud for me to even know what I read. Other times the baby is bouncing on my lap grabbing the pages of my Bible. I may read a passage and have no idea what it means or how it connects to the bigger picture. If I’m doing a study, I may not get to all the questions I want to or even understand the question if little ones are hanging over me. Sometimes I feel I’ve lost some of my critical thinking brain cells in mothering. That’s okay. These things will pass, but don’t wait until they’re gone to develop a spiritual discipline of reading the Word. It’s going to be imperfect and that’s okay. You may not feel warm fuzzies and the fire on the mountain. You’re reading the Word. You’re making a habit. Even if you feel you’re getting nothing out of it, do it. It’s not pointless. You’re laying the brickwork in your own heart that this is where you come to feast. These Words, these pages are the brook, the well to quench your thirst. No broken cisterns here, this is the green pasture of rest. These are the words of life and they are the light of men. Don’t wait for your ideal circumstance to read the Word regularly. Do it anyways. There’s so much more to say, but if you’re a mom you probably have a little one calling for you right now. Mine are about ready for lunch. So, meet back here in a day or two? We’ll talk about some practical resources and how to incorporate the Word and prayer into the rhythm of our days. Don’t lose heart. He is faithful to keep you.